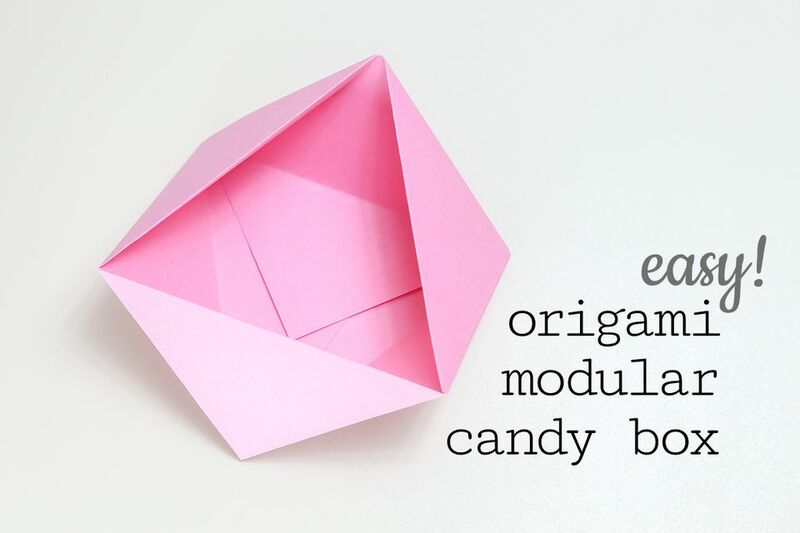 This is a super simple way to make a useful origami candy box or dish to serve snacks or to keep things like jewelry nicely presented! A great origami that kids can make too! You will need three sheets of square paper, any weight and size, this is a great introduction to 'modular origami' which uses more than one sheet of paper to make the final model. You can make this box in under five minutes once you have the hang of it, so it would be a great box to make if you need a lot of them! Although this box needs a tiny bit of glue at the end, if you used thick paper or even card, it would still stay together fine. There is a similar box that has four sides and is made from one sheet of paper, check out the tutorial for that one here. 1. Start with 3 sheets of square paper, it doesn't matter if the paper has a white side, you won't see it. 2. Start white side up. 3. Fold the paper in half diagonally to make a triangle. 4. Fold the right and left corners up to meet the top of the triangle. 6. Unfold the left and right corners. 7. Fold the top point down to the middle. 9. Make two more exactly the same way. 10. Holding one in each hand, put the left side of the second one in your right hand into the opposite flap of the first one. 11. This is what it should look like. 12. Now put the third one into the second one. 13. Now bring the first one around to meet the third one to connect them all. 14. This is how to join them. 15. This is the final model. 16. You can use a bit of glue to stick the bottom together. 17. You'd need to stick a few flaps together.